• East County Magazine (www.EastCountyMagazine.org): Winner of 112 journalism awards since its inception in 2008, East County Magazine averages over 6 million hits and 250,000 visits a month. The site provides public interest news for San Diego County's inland region. • East County Guide: Unbiased information on local atractions in San Diego's inland region. • East County News Service: Nonprofit news stories available for syndication and reprints. • East County Watchdog Investigative Journalism: Our award-winning investigative team has won many awards for coverage of issues such as wildfire safety and preparedness, emergency response times, energy and land use issues, and First Amendment freedoms. • East County Magazine Radio Show airs on KNSJ 89.1 FM, nonprofit public radio station. 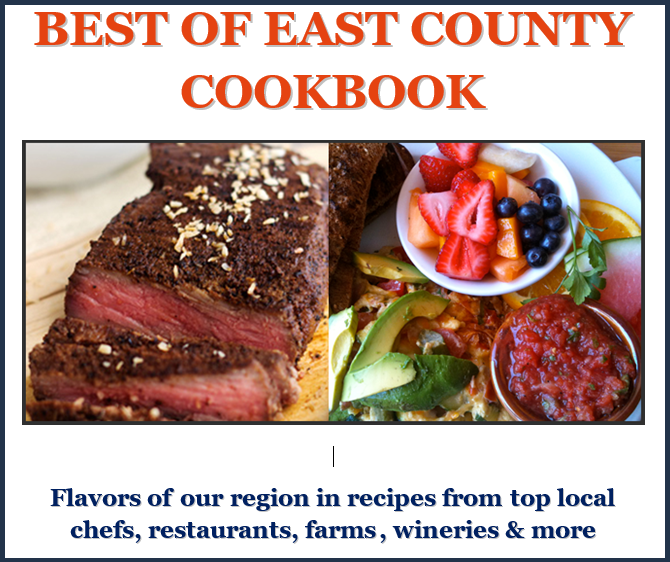 • Best of East County Cookbook features recipes from local restaurant chefs, farms, and wineries; proceeds benefit East County Media. • East County Dining Club meetings monthly at local restaurants that donate 20% of proceeds to support our nonprofit news and wildfire/emergency alerts projects. • East County Arts, Music and Literary Reporting assures coverage of the local arts and cultural communitise in San Diego's East County. • East County Sustainability and Multi-Cultural Reporting includes coverage of envrionmental news and diverse communities in our region. • East County Sports provides coverage of local youth sports including high school, SDSU, and more, showcasing promising young talent in our region. • East County Fest was East County Magazine's10-year anniversary celebration featuring artists, musicians, authors and local newsmakers. We hope to support making this an annual event.